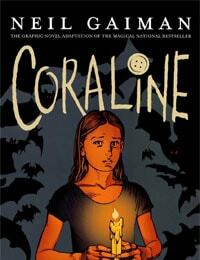 Coraline Average 0.00/5 - out of 0 total votes. Coraline was a book written by Neil Gaiman. The book follows a young girl (Coraline) who moved to a new building with her parents. The building is home to not just her family but a few other folks as well. As Coraline discovers throughout the book, this building is not quite what it seems. Upon entering a door that supposedly led to the apartment next to her family's (which she was instructed NOT to do) she discover's a whole new seemingly better world. The other world is complete with her "other mother" and "other father" who are just like her parents only having buttons for eyes. However, as she comes to discover, there is something much more sinister going on in this "other world". Will Coraline be able to face her demons and save her real parents from the clutches of the "other mother" or will she be trapped in this "other world" forever?